In following Mormon tradition that “some things are too sacred to share,” perhaps we should remove from our canon and our speech all references to any man or woman beholding the resurrected Lord. We should eliminate Mary’s testimony from the Garden Tomb. It’s simply too sacred. We should take out the experience of the Road to Emmaus of Cleopas and the unnamed disciple who walked with Him for nearly the whole day where they were taught by their Lord in a way that caused their bosoms to burn within them. As Donald Trump would say, “Take ’em out.” Sacred speech is kind of like hate speech after all because it makes people feel uncomfortable. The story of Stephen as he’s being stoned, seeing the Risen Lord even on the very right hand of God. Saul, meeting the Lord on his way to Damascus. Peter and the Twelve eating with the Lord, who entered the room by walking through a wall. 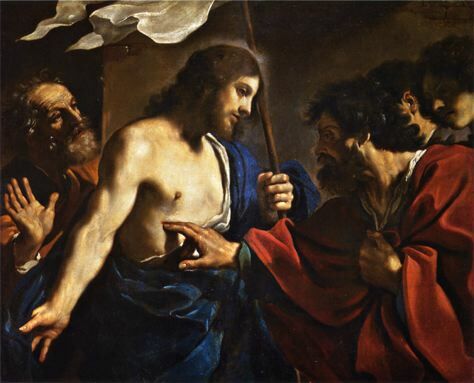 Thomas bowing to kiss His feet and touch His hands after doubting His resurrection. Then of course there’s the Book of Mormon. Lehi seeing our Father on His Throne. Nephi being taken to a very high mountain by our Lord and becoming a witness to all of His Creation. Jacob who saw Him face to face. Enos, who prayed all day and all night until the Lord called Him Blessed and forgave him of his sins. Alma, Benjamin, Mosiah, Alma the Younger, Ammon, Amulek, Omner, Himni, King Lamoni and his father, and their wives and their households, ALL of whom beheld Him and were taught by Angels and who were redeemed by our Lord. Mormon, Ether, Mohonri, Moroni and many many more. All too sacred. This way, nothing sacred is cast before swine and even better, because you do not provide detail — those listening are able to imagine wonderful and special things in their minds that remain as vague as our doctrines and as boring as our meetings have become. This entry was posted in Main and tagged apostasy, Awaken, Calling and Election, Church leaders, Jesus Christ, special wintnesses on January 15, 2017 by Bishop Anon. One of the MAIN purposes of such sacred experiences is to bear testimony of said sacred experiences to the world SO THAT others may have faith in Christ. To hide such a testimony is to work AGAINST the Lord. Bearing such testimony is part of the very process by which the Father brings to pass His covenants. Mormon explains it in Moroni 7:29-32. Think about it. Did Joseph’s or Denver’s testimony spark a flame of faith? Did either of their testimonies cause you to seek Jesus more earnestly? In my Mormon life, especially as a missionary and as a leader, I was caught up in the feeling of conviction so strongly that I found myself using vague expressions about my “knowledge” that the Church was true, that Joseph Smith restored the fulness of the Gospel, that Spencer/Ezra/Howard/Gordon was the Lord’s mouthpiece, that Jesus is the Christ, and so on. I felt so sure of it. I had had unusual, emotionally moving, peaceful experiences that I believed were the Witness of the Holy Ghost. They were unusual enough that I didn’t want people to make fun of them, so I used vagueness as a shield of my feelings and convictions. I know sort of how the many members feel when they bear their testimonies, and I think the leaders are doing something they have been doing all their lives. I do not think they willfully, consciously deceive. I think they have learned the defense mechanism early, and they still rely on it. That said, I think you make a strong and valid point about the contrast between modern LDS prophets testimonies and scriptural stories about revelation. Well said, my friend! I totally agree! I think they truly believe they are true messengers. I don’t hate them or fault them for that and I think your point is very well taken that we should all remember what most of us have experienced in that regard. Thanks for your thoughts Dave! Amen AB. What can I say more? I recall man years ago after returning from a very difficult mission sitting in the Stake President’s office for my exit interview. He testified to me that there were people in my very ward that had walked and talked with the resurrected Christ. He became very emotional as he spoke of it. The spirit was strong and I truly believe he was sincere. But, nobody ever spoke of it. To this day I still wonder who those people were and I find it to be an extreme injustice to the rest of us who desire to see the Christ and to talk with the Christ to deny us their testimony. Most likely these people were instructed just exactly as you mentioned, that their experience was far “too sacred” to share. I must admit that I crave those testimonies. My whole life I have wondered if “the Brethren” had seen the Christ and if so why do they not share that experience with us? Unfortunately, the years of empty testimonies have led me to the conclusion that they haven’t seen him and probably won’t see him any time soon. Based on this pattern, would we ever have scriptures? Too sacred to discuss or record? I somewhat agree with Dave, but on the other hand I would call the current situation one of “deception by omission”, because the top officers must know that many members believe that divine visitations are common among the higher ranks. The leaders allow this perception to exist and be perpetuated without challenge. Growing up in the church, I was taught by low and mid-level teachers and officers that the first presidency and the apostles know Christ personally, and that divine appearances in the temple are not uncommon. If pressed hard enough, and specifically enough in private meetings, the leaders will generally admit they’ve never seen the Lord. One example is the meeting that Ezra Taft Benson’s grandson Steven had with Elder Neal A. Maxwell. Maxwell admitted to him that he had no physical or in person witness of Christ, and had no distinct dreams or visions either. I suppose in partial defense of the leaders, most of them were raised with the idea that being called into high office in the church means that God respects you and considers you to be special. They sincerely believe the idea that “Whom the Lord Calls He Qualifies”, which is a false and unscriptural idea. It mistakenly assumes that all callings are made by revelation, and it mistakenly assumes that a calling made by revelation will result in a successful and righteous administration. In the end, they really have no valid excuse or defense for their behavior. They have had a chance to accept the modern day equivalents of Abinidi or Samuel the Lamanite. These came in the form of Denver’s book Passing the Heavenly Gift, Adrian Larsen’s blog To the Remnant, and Rock Waterman’s blog Pure Mormonism. Rather than receive those messengers, the leaders figuratively burned them at the stake, by confirming their excommunications, and have continued on with their Wizard of Oz way of doing things. And I’m guessing that you also (AB) have been punished or threatened for what you have written. So that is a minimum of 4 highly visibility messengers who have offered strident warnings, plus they have received many letters and complaints from less visible members. I think the officers are racking up some seriously bad karma, and while I don’t “hate them” on a personal level, I do hate their behavior. It is ignorant, arrogant, unChristlike, and unacceptable. They are taking the Lord’s name in vain by implying that they know Christ personally. I think that President Nelson in particular is guilty of that, (per the details in “Special Watches and Witnesses” on Adrian’s blog). At the very least, they are taking the Lord’s name in vain by allowing the myth of “the apostles know God” to be perpetuated within the church. I truly wish they would repent, but I have little hope that will happen. I guess all we can do is continue to warn them, and try to show love and patience towards them. So if any leaders are reading this: come on guys, check the warnings again, please fast and pray about what is being said, and try to open your hearts. We recognize that you are good people, that you have good intentions, but you are on the wrong path – the current traditions are misguided. Mainstream Mormon thinking is not leading to Zion. It is leading to people to put too much trust in you and your personal doctrines. Please humble yourselves and seek to meet the Lord in person, and get your marching orders from his own mouth. Hence the sacred experience is learning how to become a “holy” person in thought, word and deed is personal! Thank you so much for your comments here. In “Words of the Joseph Smith” he admonishes those called to the apostleship cannot fulfill their call until they meet personally with the Savior, view his wounds, and access an anointing. Joseph was candid and clear, an apostle cannot testify as a special witness of Christ until each has met Christ and after a personal anointing is responsible to testify of Christ. Joseph’s declaration of this requirement is constantly refuted, sadly so. Such testimonies are not too sacred to share, they are a requirement of the “call”. I was in the MTC during April and May of 1993. Brother Richard G. Scott came and spoke to us one day. I’ve forgotten everything he said save one line: “I know the Lord lives and it’s not by faith that I know.” He said it in the low, slow drawl he was known for, but didn’t elaborate. I think the implication was pretty clear and I believe him. If he lived a worthy life and achieved that blessing, super! I rejoice for him. So there’s been at least one, but I absolutely think you’re post is spot on. I’ve come to believe we have a Quorum of the Board of Directors. It doesn’t even bother me that they don’t possess those gifts of the spirit (revelation, prophesy, etc). That has no bearing on my salvation. The only thing that does bother me is that they allow themselves to be regarded and treated as such. Seems disingenuous to me. “When a man has the manifestation from the Holy Ghost, it leaves an indelible impression on his soul, one that is not easily erased. It is Spirit speaking to spirit, and it comes with convincing force. A manifestation of an angel, or even of the Son of God himself, would impress the eye and mind, and eventually become dimmed, but the impressions of the Holy Ghost sink deeper into the soul and are more difficult to erase” (Answers to Gospel Questions, Joseph Fielding Smith Jr., 2:151). I think that many officers of the church use this principle to claim actual knowledge, even though they don’t have a physical witness of Christ. Given the fact that JFS never claimed to have received a physical witness, I take issue with his idea that such a visit would become dimmed in one’s mind over time. When the resurrected Savior appears to someone, wouldn’t the Spirit also witnesses to them that they are in the presence of God? That is the mission of the Holy Ghost, to testify of all truth. I think the combined force of both the physical and spiritual witnesses would result in something ironclad, and searing to the point that it would never fade or become dimmed in one’s mind. It would be the single-most powerful and defining moment of one’s life — impossible to eclipse with any other experience. In this regard, I think that a physical appearance of Christ would result in a testimony that is of a higher order than what the Holy Ghost alone can provide. 5. Knowledge Impressed by the Holy Ghost — “by the power of the Holy Ghost we may know the truth of all things” (Moroni 10:5). To obtain flashes of insight or knowledge from the Holy Ghost generally requires obedience to specific laws, upon which specific blessings of knowledge are predicated. (i.e., experiments of faith unlock knowledge for us, as noted in John 7:17 and Alma 32). I will hazard the opinion that Elder Scott’s testimony of Christ was at the #5 level, with a possibility that he achieved the #4 level in some limited areas of the gospel. Meanwhile, I think it’s very clear that he was stuck hard in the mud at #7 level in many areas of gospel knowledge, just as most mainstream members are. I think that anyone who reaches a knowledge level of #3, #2, or #1 is going to be a non-conformist, boat-rocking, apple-cart-upsetting type of person in many aspects of their life. They will be hated and reviled for the experiments of faith they undertake, for the knowledge they obtain and testify of, and they will likely be considered fallen, evil, or insane by those who were once their friends (Matthew 10:34-38). Elder Scott’s administration as a general authority showed little to none of those kind of attributes. He was for the most part well liked by his fellow officers, by the common membership, and by those outside the church who interacted with him. He didn’t meaningfully challenge very many time-honored traditions, or rock the boat much, and he didn’t do much calling to repentance, except within the limits of what is entirely acceptable within the mainstream. None of this is to suggest that his testimony at the MTC wasn’t powerful and authentic in some important ways. I think that to some degree he was justified in saying that he actually “knew the Savior lived”, because he had lived the basic commandments faithfully enough to have the Spirit reveal that fact to him. In that regard, he was a “minor prophet”, just as you and I are minor prophets, because we posses a conviction of the Spirit regarding the Savior. Our knowledge is real, but it’s not a “special witness”. It’s more of a common witness, which is experienced by millions of Christians around the world, who are at various levels of maturity within the level #5 category of knowledge. I think that moving past the #5 level of knowledge in any area of the gospel requires putting ourselves into some deeply uncomfortable and difficult experiments of faith. And we tend to shy away from these kind of experiments in almost all cases. We don’t want to take the scriptures literally, or take the risks that are necessary to test certain aspects of Christ’s message. We prefer the soft, fairy tale version of the gospel that is currently popular within the mainstream. I loved Elder Scott a lot, and I appreciated his testimony. There was something powerful and deep about him, and he was a fine Christian man. He probably lived some of the commandments more faithfully than most. In the end, however, I think he failed to attain the true office of an apostle. It seems clear to me that he never met the Lord face-to-face. He never testified of such a meeting, and he never called the world to repentance in such a way that would indicate he was anything more than a common Christian solider, whose testimony was based on common spiritual impressions. And although there is great value and honor in being a common solider, and in sharing the impressions that the Holy Ghost gives us, I believe that God wants us to move past that at some point, and become something more. Very well said! Great observations. You could very well could be right, which is why I added the “if.” I honestly don’t know. But sitting there in the room when he said it, I don’t think there was any other way to take the statement. I spoke with other missionaries afterwards who expressed similar sentiments. If he meant to imply something that didn’t happen, well, that’s between him and the Lord. I don’t think its for us to decide someone’s personal worthiness to receive that blessing, or where on a numbered scale someone we’ve likely never met or spent personal time with falls. It’s not our place to judge someone’s personal worthiness or spiritual progress based on our limited vision, regardless of position or station. We simply don’t know. You are, of course, entitled to your opinion. I have no problem with that at all. I just think we need to be a bit careful about any sort of spiritual judgment. I’m in the same boat with just about everyone else here. I’ve realized “the church” isn’t what I was taught to believe and there are a lot of things that need to be addressed and corrected; but we would all be well-advised (especially me) to practice patience, long-suffering, persuasion and love unfeigned. That’s what our Lord requires of us. Yes it is for us to decide if they’re true prophets or not. We are commanded to discern, in fact, lies or deceit from truth. I liked Matt’s attempt at ranking. The question here is whether some of the apostles are outright lying. If you were in their shoes, given that there is Denver Snuffer’s testimony that the Lord IS appearing, how can they in good conscience insinuate they are “special witnesses”? Seriously. If they were ignorant of the controversy of their claims, they might reasonably claim innocence. But in today’s age where their integrity is being openly and certainly regularly challenged, any doubling down on such insinuations can only be judged to be nefarious and 100% of the devil. Okay, at best they might be grossly deceived. Understandably, it’s politically incorrect to say this, but the truth is the truth. Be sure to not be whitewashing or “daubing” the wall (see Ezekiel 13:9-15). There’s a nasty consequence in verse 15 for those who continue to be politically correct. Remember that the church has allowed the word “know” to be redefined such that nursery age children, who can barely speak, are taught that they “know’ the scriptures are true, without having undergone any form of wrestle with them. Numerous people stand before a pulpit on the first Sunday of each month and proclaim that they “know” God lives. Have they seen Him? Have they seen his face? The scriptures are clear that one cannot know God unless they have seen Him (Ether 3). Until that point it is faith and faith only that men have. Now when I hear people say the know something it’s almost instinctual to reinterpret their statement to mean they “really really believe” it. True actual knowledge is in short supply these days. Thank you for this post! You put words to my thoughts in a way that is so plain and powerful that I will now have greater ability to see things and teach others more clearly. Thank you, brother!! Hi, Underdog – I appreciate your insights wherever I see them. You’re a good dude/dudette. I think my comment is misunderstood. I think we all agree that the 15 aren’t prophets, seers and revelators. I think the office of “apostle” is just that, an office, just like the office of deacon, teacher, priest, elder, etc. They’re basically job titles, not indicators of spiritual gifts or entitlements to the holy priesthood. Yes, we do have an obligation to determine whether or not their messages are prophetic. No question. My comment is that it’s not our place to determine someone’s personal worthiness independent of the office he or she may hold, if that makes sense. Can someone receive the second comforter independent of “office?” I don’t know. I think so. I don’t see why not, but who am I to say? But like I said, we enter dangerous territory when we seek to determine someones *personal* worthiness or spiritual experiences without having the full picture. That’s all I’m saying. Years ago I spoke to a man who had these experiences. I queried him because I noticed certain things that he said led me to believe he had something most did not have. He didn’t advertise it at all, in those days they mostly didn’t. But because of their experience, it was impossible to keep their light completely hid, yet members in general did not (and still do not) possess the spiritual perception to notice. So these people walked in their midst and they had no idea. This RM you spoke to had the perception and was paying attention. I can only surmise you didn’t realize what to listen for at the time. Now the Lord is putting things in motion again, so He wants more people to know this is available. “I know the Lord lives and it’s not by faith that I know.” He said it in the low, slow drawl he was known for, but didn’t elaborate. Elder Scott uses a subtractive term – ‘it’s not by faith’, well then what is it? He doesn’t say, but leaves it to the hearer’s imagination to guess what that is. These are the sort of semantic gymnastics they employ such that they make a non-testimony sound like something profound. If they don’t say what it is, if they only say what is isn’t, they haven’t said much at all. It’s like if I said I acquired a car today, but I didn’t use a credit card to get it. Well, that still leaves a number of options open, doesn’t it? By getting the listeners to focus on what it isn’t, it leaves it open to imagination what it is. If that isn’t deception by omission then I don’t know what is. Thank you again. Having had spiritually intimate association with the Lord, I strive daily to experience the Enos association and thereafter a one-on-one visit with Christ. As others seek the same experiences, I want to bear testimony Joseph’s “first vision” experience was what he called it, a “vision”. My conviction I’m stating this comes from a profoundly intimate experience with my seminary class decades ago. I would say more, but would prefer not to have the experience ridiculed by anyone who may not have been so generously blessed. I will state my class of 32 students cried, guarded the Relief Society class entry doors and begged to not have the class end. The Lord is so generous and the Holy Ghost is so amazing. The Gospel is true, even if the Church has lost its footing with regard to integrity and teaching truth.